Germs are everywhere. They are even living on you! Germs are tiny organisms that invade your body and may be harmful or sometimes even fatal. These microscopic bacteria surround your everyday activity. We come in contact with many different types of germs such as bacteria, viruses, fungi and protozoa. What they all have in common is that they can make you ill! Viruses cause colds, coughs and in more serious cases, AIDS. Fungi causes athlete’s foot and yeast infections. Other infections are intestinal infections and diseases from Protozoa, which spread through contaminated water. Although these germs are very harmful, bacteria can be good for your body. Bacteria helps keep your digestive system organized and well-maintained. You may want to do this activity with a few people. 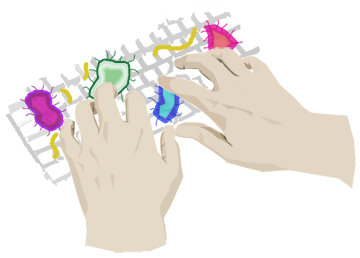 First, make a list of all the things you know about germs. Brainstorm reasons why it is very important to wash your hands periodically. After brainstorming, smear a decent size block of wood with glue, and sprinkle glitter all over the glue. Pass the block around and allow for each person to hold it briefly. After this is done, make a note of various things you notice. For example, the color of glitter each of you have. Finally, take a paper towel and wipe the wood. Continue to observe the wood and paper towel, making note of this as well. Don’t forget to wash your hands when you’re finished! Now that you know how germs spread, let’s see how good you are at spotting where they may be. Sit in a room that has plenty of activity. Draw it out in your journal and observe where specific germs may be. Is there anything that might be covered with a lot of germs? Make every note possible. While observing, think of ways that you could get rid of these germs or prevent them. Did you remember to wash your hands? How long did you wash them for? If you can’t seem to remember, then you’re not germ free! The first thing you need to do is turn on the warm water. Next use soap and lather for about 10 - 15 seconds. Make sure you get in between those fingers and under those nails. Oh, and don’t forget your wrists too! Finally, rinse, and dry with a clean towel. Now you know how to wash your hands correctly. Throughout the day, time yourself when washing your hands properly to get rid of those germs! What is one way to protect yourself from germs? How many major germs are harmful to us? What type of germ can cause strep throat? True or False: All bacteria is bad for you. What is the most germ-infested object? TEDed How do germs spread? TED We're Covered in Germs! Let's Design for that. Video Do Bugs Need Drugs?